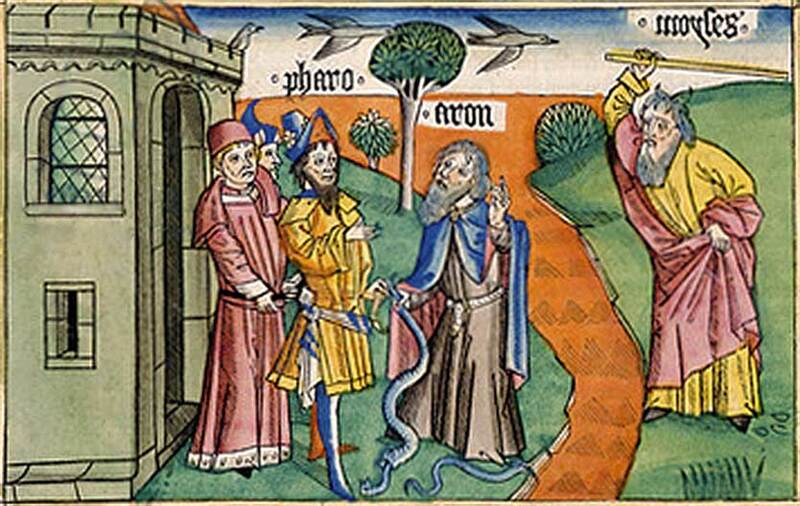 This wonderful woodcut from the 15th Century Nuremberg Bible shows Aaron's staff becoming a serpent, the subject of today's Scripture. On the right, a horned Moses turns the Nile into blood. A sublimely beautiful version of the Lord's Prayer, very Russian Orthodox in sound. 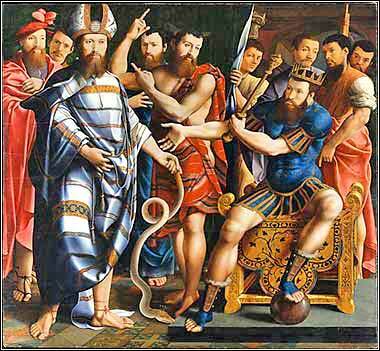 This oil by an unknown artist depicts the French King Francis I as Pharaoh; it was commissioned by the Dinteville family, who was having a political dispute with him. And the Lord said unto Moses, See, I have made thee a god to Pharaoh: and Aaron thy brother shall be thy prophet. Thou shalt speak all that I command thee: and Aaron thy brother shall speak unto Pharaoh, that he send the children of Israel out of his land. And I will harden Pharaoh's heart, and multiply my signs and my wonders in the land of Egypt. But Pharaoh shall not hearken unto you, that I may lay my hand upon Egypt, and bring forth mine armies, and my people the children of Israel, out of the land of Egypt by great judgments. And Moses and Aaron did as the Lord commanded them, so did they. And Moses was fourscore years old, and Aaron fourscore and three years old, when they spake unto Pharaoh. And the Lord spake unto Moses and unto Aaron, saying, "When Pharaoh shall speak unto you, saying, Shew a miracle for you: then thou shalt say unto Aaron, Take thy rod, and cast it before Pharaoh, and it shall become a serpent." And Moses and Aaron went in unto Pharaoh, and they did so as the Lord had commanded: and Aaron cast down his rod before Pharaoh, and before his servants, and it became a serpent. Then Pharaoh also called the wise men and the sorcerers: now the magicians of Egypt, they also did in like manner with their enchantments. For they cast down every man his rod, and they became serpents: but Aaron's rod swallowed up their rods. We used the King James Version today, because its tone gives such grandeur and importance to this momentous scene, as Yahweh, the God of the Hebrew slaves, confronts mighty Pharaoh. Pharaoh is not impressed when Aaron shows him the first of Yahweh's signs. He believes that this is the same magic his priests use, and that Yahweh is like the "gods" of Egypt. Then, in a scene rich with metaphor, Aaron's serpent devours the serpents of the magicians. Pharaoh apparently was psychologically incapable of absorbing what had happened right in front of him. In modern slang, he pooh-poohed it. Psalm 115, excerpted above, is very similar to Psalm 135, and they deal directly with the gods of Egypt. "They have eyes, but they do not see" means literally, of course, that these inanimate statues are simply lifeless carvings; they have the shape of eyes carved on their faces but they are without power; they do not function as eyes. But Pharaoh also has eyes that do not see. They register the image of what happened, but his pride — his hardened heart — refuses to register its significance. He cannot absorb the truth, because it would mean changing his mind, even slightly, about his omnipotence. Why, though, does God interfere with Pharaoh and harden his heart even further? Of course, we might not fathom the mind of God, but one simple answer is that God intends to punish proud Pharaoh and his idolatrous nation. We have seen Sodom and Gomorrah stricken from the earth for their sin, already. Another answer comes later in Exodus: God intends this as a show that will not be soon forgotten, a demonstration of His power and wrath against those who ignore Him, and a show of His love for His chosen people. He wants people to know about Him, so that they can become righteous.